A RUP LIFE: Book Review: Play With Me! Book Review: Play With Me! 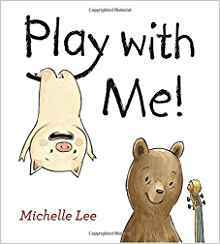 I received this sweet book by Michelle Lee - Play with Me! This book explores two friends who have different interest and have to find a way to come together to enjoy play time together. I love the simplicity of this story. It might be simple but it really is a good lesson. Children often forget about their playmate's feelings when it comes to playtime. They want to share their favorite toys which might not be to the liking of others. We once had a playdate that very much 'played out' like this book. The child came over and my son was so excited to show him all his toys. They just weren't that exciting to the other child. It took some time to find something they both had in common so they could play together. Eventually they found something both enjoyed and by the end of the play date both kids had fun and lessons were learned. Sharing isn't the only lesson there is to playing. Sometimes we need to learn about our friends and see what they like and find common ground. That is exactly what this book is about! I just loved it. Pip and Nico both want to Play. But what can they play together? Get your copy of Play With Me! at your local book retailer or online at stores like Amazon.